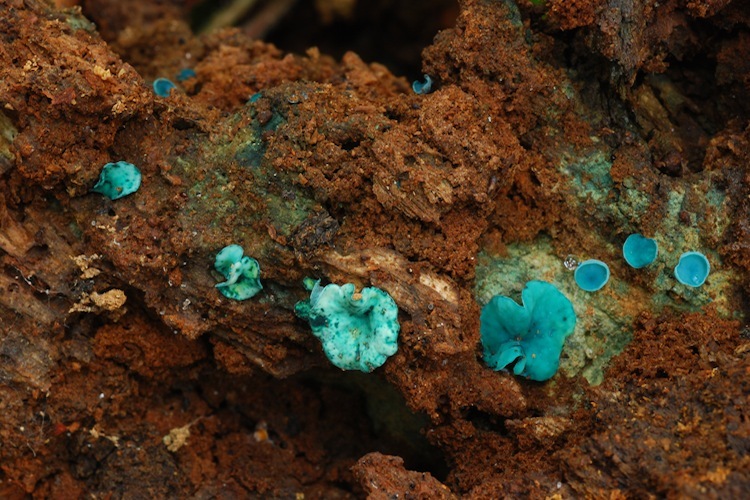 Chlorociboria produce small cup-shaped fruitbodies that often grow in troops or large clusters. The bright blue-green color, small size, and slightly stalked structure are distinctive. The only vaguely similar species in our area is Catinella olivacea, which is smaller, a darker olive-green, and lacks any sort of stalk. Saprobic, primarily on fairly rotted (sometimes more intact) hardwoods, more rarely on conifers. Observers should pay special attention to this, since there may be cryptic diversity in this genus correlated with substrate identity. Only two species are reported from our general area. Identification of the genus is easy due to color and shape. 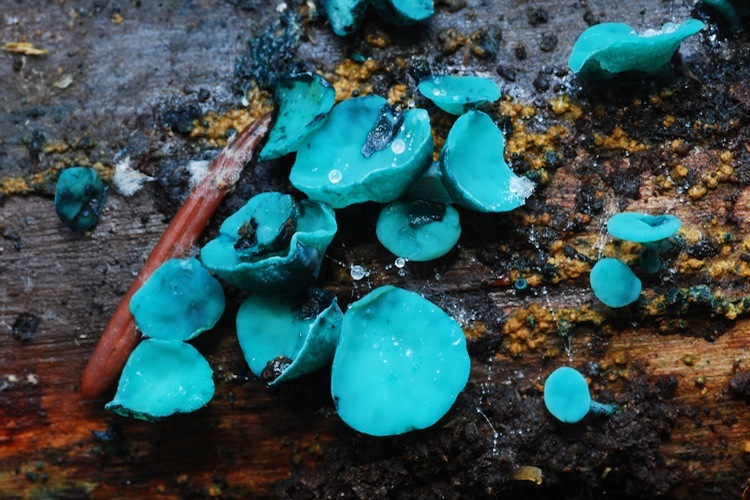 Separating the two species from one another is simple, but unfortunately requires a microscope: Chlorociboria aeruginosa has larger spores (always above 9 microns long), whereas those of Chlorociboria aeruginascens are shorter than 10 microns. Although there is a small overlap, a decent sample size should point clearly to one or the other. There may be other, correlated characters (intensity and hue of color, host substrate) that have yet to be well-studied. When surveying habitat for the presence of these fungi, the best way to detect them is often to find a fallen piece of wood and scan the exposed heartwood or peel back the more-decayed areas looking for the characteristic blue-green stains made by the mycelium of these species. The color is due to xylindein, a quinone pigment.